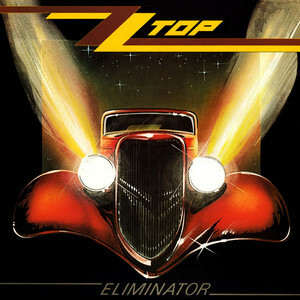 ZZ Top’s Eliminator album, with singles such as Sharp Dressed Man and Legs was a welcome relief from the rest of the charts. The singles charts in the early eighties were wonderfully diverse, but they rocked about as hard as a James Blunt-themed episode of Glee. There were more balls in the East German Women’s Olympic shot-putter team than in the UK charts. In 1983 only Genesis with “Mama” and in 1984 only Queen with “I Want to Break Free” were in the Top 40 best selling singles of their respective years. For some reason (and it certainly wasn’t their dress sense) Status Quo were the only rock band that got their songs played on Radio One (their critics said it was the same song) so when another rock band with guitars also miraculously made the charts it made a big impact. ZZ Top appeared fully formed apparently from nowhere in 1984 with a drum machine, fuzzy guitars and more facial hair than an Italian grandmother. This approach was a clear leap forward from Black Sabbath (fuzzy guitars and facial hair but no drum machine), Godley and Creme (drum machine, facial hair but no fuzzy guitars) and Sigue Sigue Sputnik (drum machine, fuzzy guitars but no beards). They had a drummer called Frank Guitar, which was ironic because he was the only guy in the band without a guitar. Their slick videos featured amazing cars, girls and beards, (NB. not girls with beards). As the nation wrestled with whether they were pronounced “Zed Zed” or “Zee Zee” Top, the band rocketed up the singles charts with “Gimme All Your Lovin’” and the album “Eliminator” became the first record that I bought. It turned out the band had history: Eliminator was their eighth album and Jimi Hendrix once described Dusty Hill as his favourite guitarist, which was ironic as Dusty is the bassist (they are hard to tell apart because of the beards*). ZZ Top followed up Eliminator with the Afterburner album and whilst reviews were good some critics highlighted the songs on Afterburner saying they were the same songs as the previous album but with slight changes. To counter these criticisms of self-plagiarism ZZ Top cleverly named their next album “Recycler” which again featured the same songs with slight changes, and then outflanked the critics entirely by releasing a Greatest Hits Package, which featured all the same songs as the previous albums only without any changes at all. It sold millions. ZZ Top were very slick live – albeit the lightshow put in a harder shift than they did. The band was so relaxed they might have faxed their performance in that night. I remember the crowd singing along to “Tube Snake Boogie” whilst the band played on a stage set designed to look like the Eliminator car. After playing their hits for just over an hour they vanished in a puff of smoke from behind spinning white guitars at what was a magical climax. Billy Gibbons may have put in a lazy set, but he was and still is, a guitar-God amongst men. (*This isn’t true: he really did say Billy Gibbons was his favourite guitarist though). Eliminator is a classic album. Not a bad song on there. This comment is 4 years too late, but as I’m a fairly recent visitor to your patch I’m catching up on your earlier stuff. I also saw the Top, as I don’t call them, at Wembley. Last year, early July 2015 , while my partner and I were holidaying in Europe/UK. I wanted to see The Who, at Hyde Park, but my other half (a) doesn’t like The Who, so when I’ve seen them before, twice, I’ve gone without her; and (b) didn’t want to wade through 100,000 plus people and then have to make our way across London at 10.30 pm. So ZZ Top was a compromise. Their act, att this late stage, has more ham than a barnyard full of pigs, but they can certainly play. Having Jeff Beck join them for the 20 odd minutes of the encore was pretty fabulous. Thunder were the support for this gig, too. Somewhat callously, we enjoyed a feed of pasta with a glass of sparkling in the summer evening and wandered into the arena a few minutes before the headliners took to the stage. ZZ Top were great. Not as good as The Who, though….